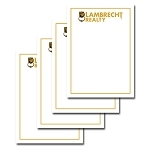 Complete your business identity with full color letterhead printed on 60# Accent Opaque stock. This uncoated stock is perfect for letterhead and also light enough to be re-fed through a desktop printer. We also offer black sheets for purchase so you have have multiple page letters of matching stock. 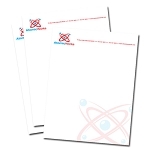 Our Stationary is printed A7 size or 5" x 7" and is a very classy addition to business correspondence when you want to give that hand written, personal touch. Printed full color and full bleed on thick 120# uncoated cover.